Following the sexual assault committed on an elderly woman, at her dormitory at the Holy Family Senior Citizens’ Home, Vlissengen Road, on Tuesday, the victim is still traumatised, and now suffering memory loss, sources yesterday said. 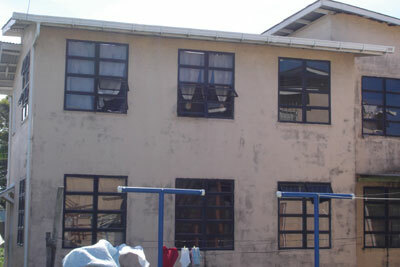 The building in which the elderly woman was found sexually violated. Meanwhile, police are still looking for clues, but have so far made no breakthroughs, this newspaper understands. The octogenarian, who has been living at the home for the last ten years, appeared to have been sexually violated early Tuesday morning, and was left bleeding on her bed after the intruder escaped. The discovery was made around 7:30 hrs, after a garbage collector who had gone to the home to empty garbage bins got no response to several calls he had made at the door. Fearing her to be dead in the house, the sanitation worker alerted the clients at another building in the yard. On opening up the building and entering her room, the woman’s colleagues found her prostrate on her bed and bleeding. They quickly alerted one of the members of the Committee of Management, whom they said immediately contacted the police who accompanied him to the scene of the crime. An ambulance was summoned and the victim rushed to the Georgetown Public Hospital where she remains warded. Meanwhile, other clients at the home remain baffled as to how the man entered the building since there were no signs of forced entry, and the windows are all grilled with steel bars. Some persons surmised he may have entered unnoticed when the victim went outside to hang clothes in the yard as she normally did. Reiterating that the report is grossly inaccurate and a distortion of the facts, the women said that the police responded promptly. Within minutes of receiving the report they had visited the scene, in the company of the management official, and by midday had made a second visit to the home. The women are calling for a retraction of the statement.